For other uses, see Welcome to Paradise (disambiguation). "Welcome to Paradise" is the second single by the American punk rock band Green Day. It is the fifth track from their third studio album, Dookie and was released as the second single from the album in October 1994. The original version of the song appeared as the third track on their second studio album, Kerplunk. The Dookie version was later included on the compilation album, International Superhits! in 2001. 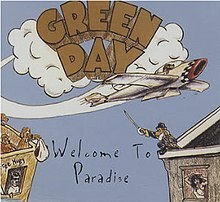 "Welcome to Paradise" is playable in the video game Green Day: Rock Band. The song peaked at number 56 on the Hot 100 Airplay chart. Track 2 was recorded on March 11, 1994 at Jannus Landing, St. Petersburg, Florida. The lyrics of the song were written by Billie Joe Armstrong, and the music by Armstrong with Mike Dirnt and Tré Cool. It is based on the band's experience moving out of their parents' houses and into an abandoned house in Oakland, California where the band members, along with a number of others, lived without paying rent. The house was quite broken-down but to them it became home, and this feeling is described in the song. It's about West Oakland, living in a warehouse with a lot of people, a bunch of artists and musicians, punks and whatever just lived all up and down, bums and junkies and thugs and gang members and stuff that just lived in that area. It's no place you want to walk around at night, but it's a neat warehouse where you can play basketball and stuff. The song is played with the guitar tuned a half-step down, as are many of their Dookie songs. The song is sung as Billie is talking or sending a message to his mother, after moving out of her house. The first verse is Armstrong talking to his mother after three weeks of leaving her place, telling her that he's scared about being on his own. The second part describes Armstrong writing to her after six months of living at his own place, now being happy to live on his own. A video was released for the song. It features the band playing live, while the studio version from the Dookie album is playing during the band's performance. It is one of two videos not to be included on the band's first DVD, International Supervideos! (The other being "Macy's Day Parade"). "Welcome to Paradise" was featured in the movie Surf's Up, though was not released on the film's soundtrack. The song was also featured in the trailer for Couples Retreat. ^ "The 10 Songs Green Day Should Play At Brixton Next Week". Sabotage Times. Archived from the original on 2014-10-10. Retrieved December 8, 2014. ^ "Green Day Album & Song Chart History: Radio Songs". Billboard. Prometheus Global Media. Retrieved April 9, 2013. ^ "Australian-charts.com – Green Day – Welcome To Paradise". ARIA Top 50 Singles. Retrieved November 13, 2016. ^ "Charts.nz – Green Day – Welcome To Paradise". Top 40 Singles. Retrieved November 13, 2016. ^ "Green Day: Artist Chart History". Official Charts Company. Retrieved November 13, 2016. ^ "Green Day Chart History (Radio Songs)". Billboard. Retrieved November 13, 2016.